A member of the Designer Craftsmen Association Robin Wade, has been designing unique ceramics since 1978. Working with a light bodied porcelain stoneware enhanced by a palate of rich, subtle colours, Robin uses a range of ceramic techniques to produce work to enhance all aspects of the home and working environments. 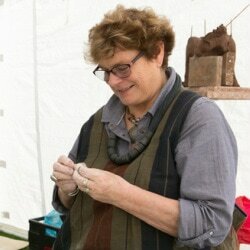 Operating from a tiny workshop, Robin specialises in the design of unique decorative tiles and panels as well as a range of smaller functional features and vessels for both interior and exterior locations including integrating her work with that of other ceramic artists and interior designers. Robin also works with community groups, running workshops and coordinating projects for the design and construction of large tile features for public spaces such as schools, clinics and nature reserves.